Meet Gordon and Marilyn Skuse. Gordon and Marilyn call volunteering a gift. Volunteering wasn’t part of their lives until after their retirement when a friend invited Marilyn to help out. Once she started spending time at Mount St. Mary Hospital, she encouraged her husband to join her. Already very busy, Gordon was intrigued by a new challenge—to manage the volunteer-run gift shop. Like Marilyn, he was surprised by how much he would grow and benefit from his time volunteering. 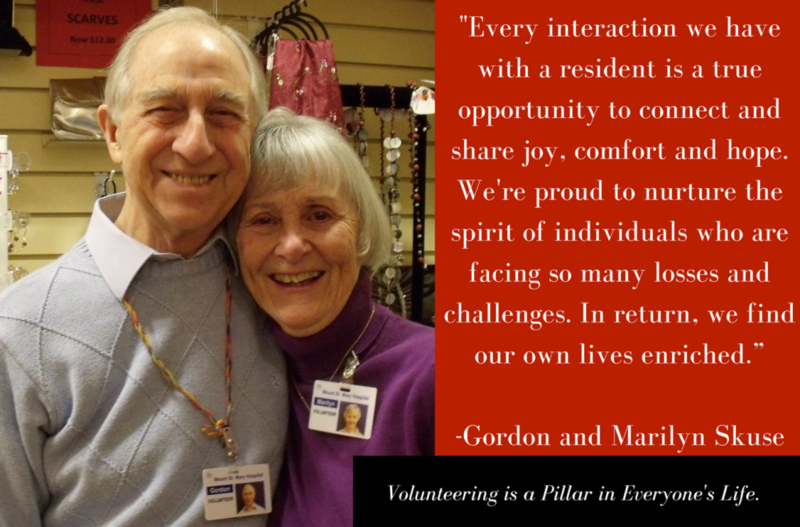 They have since left the gift shop in the hands of other volunteers and Gordon and Marilyn are now involved in many of the numerous volunteer opportunities available at this home for 200 individuals requiring complex care. From portering residents to and from activities to recommending new volunteer-led initiatives that benefit the residents, they know Mount St. Mary Hospital volunteers are valued members of the team. Looking back on their years of volunteering at Mount St. Mary Hospital, they believe the gifts they receive are so much greater than what they give. They delight in seeing residents smile and their eyes light up—they know how meaningful it is for a resident when they spend time chatting or sitting alongside them for a moment of quiet reflection. The Skuse’s find every interaction with a resident a true opportunity to connect and share joy, comfort and hope. They’re proud of their role in nurturing the spirit of individuals who are facing so many losses and challenges. In return, they find their own lives enriched.